Usually quiet. In courtship males utter a mouse like squeek. Females, harsh croak. Description: Male is slate blue, has chestnut flanks, and white markings bordered in black. Round white spot behind eye. Female is duller version of male. 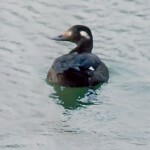 Behavior: Diving ducks, with a diet of snails and crabs. 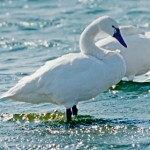 Habitat: Prefers to nest near swift mountain streams. Winters near rocky coasts. 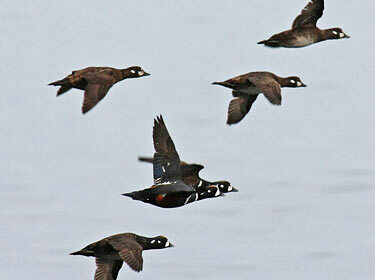 Fun Facts: The Harlequin Duck is also called the Sea mouse because of its very unducklike squeaks. 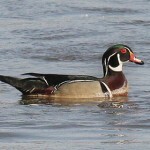 Other names include Circus duck or painted duck for its beautiful colors. Additional Information: The latin name Histrionicus means “stage player” or “actor” presumably in reference the colorful appearance which resembles an actor made up to play a role.